Cashew nuts are one of the healthiest foods in the world. Unfortunately, not many of you know the numerous benefits they offer, and only a very small percentage of the natural medicines comprehensive database is dedicated to them. Countries like Nigeria, Tanzania, Mozambique and Brazil are the biggest producers of cashew nuts, mostly due to the fact that they need hot and humid climate in order to grow. Cashew nuts are rich in vitamins, soluble dietary fiber, minerals and many phytochemicals that prevent diseases, including cancers. Cashews are also rich in calories, about 50 grams of these favorable foods contain 275 calories. These beneficial nuts provide numerous essential vitamins, including pantothenic acid or vitamin B5, pyridoxine or vitamin B6, thiamin or vitamin B11 and riboflavinThe aforementioned vitamins are crucial for metabolism of fat, protein and carbs at a cellular level. On the other hand, niacin improves the protection against pellagra or dermatitis. Furthermore, B6 is extremely beneficial for our health for it significantly lowers the chances of developing sideroblastic anemia and homocystinuria. Only 3.5 Oz (100 gr) of these nuts provide about 30% of daily recommended levels of B6 (that’s about 0.147 mg). Moreover, cashews are also rich in essential minerals. Some of the most useful minerals found in cashew nuts are potassium, manganese, copper, selenium, magnesium, zinc and iron. Only a handful of these nuts on a daily basis can provide the necessary amount of these extremely needed minerals and protect you from deficiency- related diseases. For instance, copper acts as a co-factor for many important enzymes, like superoxide dismutase and cytochrome c- oxidase. Zinc, on the other hand, plays the same role together with enzymes that are responsible for the regulation of the growth and progress of digestion, gonadal function and DNA synthesis. Selenium is a very important micronutrient and it works as a co-factor for antioxidant enzymes like Glutathione peroxides, known as one of the strongest antioxidants in human body. Monounsaturated fatty acids which are in high quantities in these nuts are extremely good for the heart health, as palmitoleic and oleic acids. They belong to the group of essential fatty acids that can increase the level of good HDL cholesterol and decrease the level of harmful LDLcholesterol in our blood. In addition, as shown by many scientific studies, the so-called Mediterranean diet which is mostly based on monounsaturated fatty acids supports the blood lipid profile, and protect our system from strokes and coronary artery diseases. Furthermore, cashews also contain a small quantity of one very important pigment of flavonoid antioxidants, called zeaxanthin, which is selectively absorbed inside the retinal macula in our eyes. This pigment provides protective and antioxidant UV ray filtering features, and it also protects from ARMD or age-related macular degeneration in old people. Unfortunately, even though cashew nuts are extremely favorable for our health, some people should not consume them. In fact, one of the most common food allergies in both children and adults is cashew nut allergy. However, even if one has consumed a small quantity of cashews, just like peanuts, it can cause very severe allergic reactions. Be careful for cashew nuts are a hidden ingredient in many common foods like ice cream, Asian meals and cakes. Whenever you experience some of the symptoms of cashew nut allergy explained below, you should look for professional help. You may experience tingling or itching around or in your mouth only a few minutes after you eat or touch cashews or food that contains cashew. Moreover, red, raised, itchy welts in different sizes may form at different parts of the body. Moreover, sometimes vomiting and/or stomach cramps are also indicating symptoms of this kind of allergy. Some more serious symptoms may include projectile vomiting, diarrhea, nausea or difficulty swallowing. It is good to point out that the airway can be interrupted by swollen throat or tongue. Asthma or hay fever in cases of airborne cashew nut allergens inhalation. Allergic reactions in the nose and nasal passages can sometimes show symptoms like stuffy or runny nose, itchy nose, eyes, coughing and itching on the top of the mouth. Another clear sign of airways issues are whistling and wheezing sounds heard while exhaling. Some other symptoms related to asthma attack caused by cashew allergy include chest tightening, shortness of breath and chest pains. Furthermore, in some cases the consumption of cashews can lead to a severe allergic reaction known as anaphylaxis. Inhalation or ingestion of even small quantities of cashew nuts may trigger an anaphylactic shock. Anaphylaxis starts suddenly and can become life threatening in a matter of seconds and that’s why it is crucial to look for immediate medical care. You can recognize this condition by the following symptoms: fast pulse, fainting, swelling of the throat that causes breathing problems, dizziness and lightheadedness etc. Apart from all the benefits that these nuts offer, Cashew Nuts are considered to be the best alternative treatment in cases of depression. A rather interesting situation was created when David Adams, FDA Deputy Commissioner for Policy who was part of the Drug Information Association Annual Meeting in 1993, stated that we must pay close attention to the things that are happening around dietary supplements and the legal arena. This meant that there may be a completely new class of products that will be competing with existing drugs, in case the producers of natural remedies manage to get the support. This is why there is a need for a special law that will regulate the supplements. As a result, a report was released in 1993 by the FDA Dietary Task Force, saying that the existence and selling of dietary supplements won’t endanger the efforts to create new drugs. As you may have already supposed, there is a much safer and effective natural depression treatment that they want to hide from us, because that would bring a major financial loss, for the big pharmaceutical industry is a huge business. What has been hidden from us is the fact that cashew nuts are an excellent source of tryptophan, which is a vital amino acid that we need to take through our food. This miraculous item regulates our mood, improves sleep, helps children grow and develop, balances our behavior and significantly lowers the level of stress, anxiety and depression. 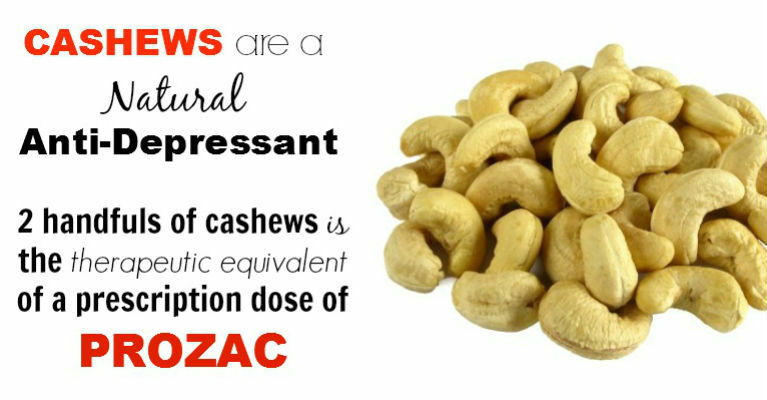 This component which has proven to be equally successful as prescription antidepressants in many cases, and cashews contain between 1.000 and 2.000 mg of it. Unlike antidepressants, they do not cause any side effects, however.